Pylons for the record-breaking Shanghai-Nantong Yangtze River Bridge are taking shape in China’s Jiangsu Province, north of Shanghai. Doka’s SKE100 automatic climbing formwork Top 50 and large-area formwork systems are being used to construct the pylons. 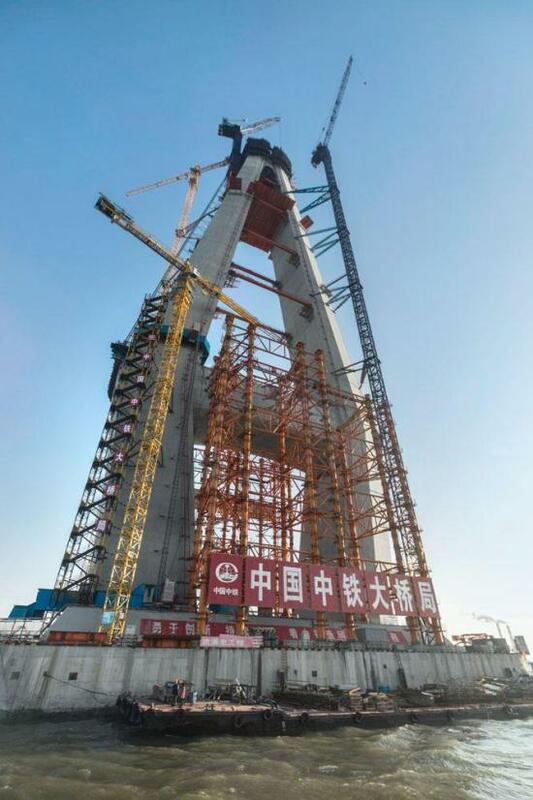 The bridge will have China’s longest cable-stayed span (1,092m) and tallest pylons, at 325m. The total length of the crossing will be 11,072m and it will have two levels, with a six-lane highway on the upper level and a four-line railway on the lower. The south bridge is a cable-stayed structure with steel framework, spanning the main channel of the Yangtze River. The north bridge crosses the Tiansheng Port channel, it has a rigid steel girder structure and a flexible arch with a main span of 336m. The pylons are being constructed in one of the biggest and deepest (115m) cofferdams ever built. The enclosed area is about the same size as 12 basketball courts. Doka has had to overcome challenges including high wind speeds and the need to climb in 55 pouring steps without major alterations to the working platforms. "Height of more than 300m and poor, foggy weather conditions are the biggest challenge for this jobsite,” said Yuan Bo, principal engineer from China Railway Bridge Bureau. Doka said that use of the SKE100 automatic climbing formwork system allows easy adaptation to to the changing geometry of the pylon legs. A single V140 hydraulic unit can climb all 30 automatic climbing units on each pylon foot at once. The automatic climbing system is combined with Top 50 large-area formwork to give the concrete its shape. The Top 50 formwork is mounted on travelling units on platforms. A total of 900 m² of the large-area formwork is being used. The formwork has been faced with Xlife sheets as they can be reused multiple times.